Very Good. 000721684X ALL BOOKS SHIPPED WITHIN 1 DAY OF PURCHASE! Good. Some slight wear to the cover. If someone you know has lost someone close and is having trouble sorting out his or her feelings, give him or her this book. It helped me IMMENSELY to get through the first month after my partner of 41 years died. Ms. Didion's book has helped me to deal with the loss of my partner of 53 years who disappeared into thin air on May 7th this year. The shock of reading in print exact thoughts that continue to run through my mind is in a mysterious way liberating. One should not be afraid of investigating all the aspects of grieving. The book does just that. If anyone needs to process the sadness of such a heartbreakingly unexpected tragedy this book will help. Joan Didion's Year of Magical Thinking is a memoir of grief. It recounts the sudden death of her husband John Gregory Dunne, with whom she was married for almost 40 years, and their daughter Quintana's serious illness. The eponymous "magical thinking" refers to the irrationality of grief--Didion refused to sell her husband's shoes, believing that he would return--the habits by which one avoids memory, the lies one tells oneself in order to hope, the movement from grieving to mourning, and the epiphanies of unbelief. Grief is the most common of derangements, Didion writes, yet Emily Post's antique etiquette book about the bereaved and the grieving rituals seemed truer to the author than the contemporary literature of self-help, most of which she found useless. Didion has always been the most acute seismographer of psychic, emotional, and social tremors, particularly her own anxiety, but here she turns her antennae to the most heartbreaking and universal of conditions. Critic John Leonard wrote that he couldn't imagine dying without having read this book. I agree. An indispensable memoir. 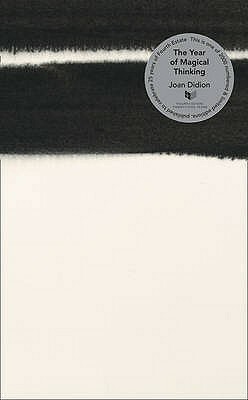 After enduring a very tough 18 months in her life, Didion wrote about her experience with coping, stress and eventual grief. Although slow in some parts, it is incredibly revealing as to the mind process that happens when death of a loved one (in this case, her husband) and subsequent serious family illness (of her daughter) takes her to review her life and experiences with these people. I found it to be a love story, an intimate look at her personal journey. Writers write when they need to discuss their emotions and Didion did just that and then published it. The sad part is that the book was completed and being readied for publication when her daughter died. I would have liked to know how she coped with this second death and the end of her immediate family unit but Didion chose not to amend the manuscript. I don't know how she managed the book tour while grieving but perhaps it was the same kind of distraction she had with her daughter's illness after her husband's death. I've read quite a few reviews of this book and although I agree it was a bit indulgent, I found the book to be a fascinating journey through coping and grief. It's not an uplifting or joyful account by any stretch, but I enjoyed the journey.